In a city full of fantastic restaurants, I frequently tease Stephane that he's lucky that I'm such a cheap date. Give me a steaming bowl of udon noodles at Kunitoraya, an overstuffed falafal at L'As de Falafal or a savory tajine from the Moroccan stand at the Marche des Enfants Rouges and you've made my day. If you would like a change of pace from steak frites and croque monsieurs, join me for lunch at the oldest market in Paris. Dating from 1615, the Marche des Enfants Rouge has partially covered stalls offering a wide range of tempting, inexpensive food. Scattered amongst the fruit, vegetables, fish, fresh pasta and flowers are stands featuring Japanese, African, Italian and Lebanese dishes. Take it away or eat your lunch in the convivial atmosphere of this small yet bustling market. Best of all, you'll have some money left over for dessert. Opening hours have recently changed. According to the man selling vin chaud, the market is open Tuesday-Sunday for lunch and Tuesday-Saturday for an early dinner. It's closed on Monday. Do you know of a place for cheap eats in Paris? If so, please leave a comment. Stephane is always happy to take me out for lunch as long as the price is right! There's always a long line of hungry people waiting for the tajines at the Moroccan stand. The wait isn't so bad because you're standing next to this flower stall. tastes of tajines, couscous, kebabs, salads and Moroccan sweets. Need some tips on how to make couscous at home. Step around to the back of the stand and watch the chefs at work! Moroccan salad with fresh tomatoes, peppers and onions, lamb tajine (a savory Moroccan lamb stew) and stuffed eggplant served with fluffy couscous. These pictures were snapped with some haste because we couldn't wait to dig in. In our enthusiasm, we forgot all about taking photos of dessert. Looks like I have an official reason to return! The Marche des Enfants Rouge is a bustling place every day of the week, but it's especially busy on Saturday. As the simple tables made of wood or tile are in big demand, don't expect to linger very long after you've finished your meal. 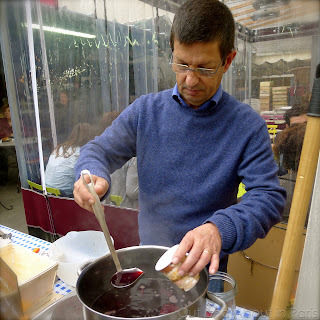 Be sure to get a cup of vin chaud ("hot wine") before leaving the market. It's the perfect hand warmer for a chilly fall day and it tastes pretty good, too! A street market filled with those choices would be a very welcome addition to the Boston dining scene. After a summer of covering the wonderful menus from our new food trucks, I'm repulsed when I walk into one of the area "Food Courts" and see chain after chain offering sanitized versions of ethnic food. Have you been to the 88 Food Court in Boston? That does have some real Asian options. Penny, After reading your post about the Falafel King, I'm craving falafels! I LOVE the Boston food trucks and wish that we had some in Paris. My son raves about 88 Food Court. He has taken his sister there but not me. I'll have to be sure to get there the next time that I'm in Boston. In the meantime, I'm keeping my eye on your website and noting all of the other interesting possibilities. This is one of the best places in all of Paris! Such authentic diversity and reasonably priced. Yum! notjustanother... I totally agree - Yum! Thanks for telling me about Q Bar. No problem that it's in the 11th. I'm always willing to travel for good Thai food. How do I not know this place? But I don't. The photos are wonderful, really give a sense of the place--and everyone looks so happy--must be the smells. Those kebobs look delicious. For cheap eats I think of Le Petit Benoit over on the rue St Benoit in St Germain but it's a cafe, so cafes are all sort of cheap. It's the restaurant with the napkins drawers for regular. We used to stay at the Bel Ami there. And the crepe stand at the Metro entrance is very good. Joseph, Don't feel bad that you don't know about the market. When the metro line that we wanted to take to get there was closed on Saturday, I went to the ticket desk to ask for an alternate route to the "Marche des Enfants Rouges". When the woman said that she didn't know it, I blamed my American accent and said it again. She had understood me but just didn't know the place. Then she turned and asked her colleague. He didn't know it either. When I told both of them that it was the oldest market in Paris, they shrugged (you know, the Gallic shrug!) and weren't that impressed. Thanks for reminding me - I still need to get to Le Petit Benoit to see their napkin drawers. I just googled the address and saw that it's right next to the Deux Magots. Darn, I was there last week and could have taken a look. Now, I'll know to check for your crepe stand the next time that I'm in that neighborhood. Do you remember if it's the St-Germain-des-Pres or the Mabillon metro? You must try the vegetarian cornet (a kind of wrap sandwich) at that market from the sandwich guy. He's not there every day and what a disappointment if he's not! I ate at Le Petit Benoit 20 years ago but not since! Great cheap eats in the 13th....lunch special during the week at Lao Lane Xang II and Le Bambou. Your tip about the sandwich guy will give me a good reason to hang out at the Marche des Enfants Rouges. On the days when he's not there, I'll just eat my way through the offerings at the other stalls. Can't wait to try the vegetarian cornet. Thanks for telling me about the places in the 13th! I finally found a copy of "The Ethnic Paris Cookbook" that I learned about from your blog months ago and will start trying some of their suggestions, too. Looks like I'll be doing some good eating in the future. The crepe stand is the St Germain des Pres stop, just beside the church there. I love the word "cornet' for a wrap sandwich--there's a pun there of course between the two languages--cornet also being trumpet, music and wrap also being music. Thanks, Joseph. I'll try the crepe stand the next time that I'm over there. Mmmm, these photos are making me hungry! So jealous right now. And isn't it true that sometimes cheap meals are the best? I've never had vin chaud before. That looks delish, too. nycgirl, NYC must have a lot of good street food. I've always wanted to try a hot dog from one of the carts but haven't yet. Vin chaud is great drink during the winter. We always drank it after skiing or at the Christmas market in Switzerland. It's one of those things that make winters all the more enjoyable. I'll have to make some and post the recipe. It's the same concept as mulled cider. real name?. b)How do I have proof that it can be my original work? point in copyrighting the articles/website?. without their knowledge and permission. This may be against the law! going to rock the mobile market with its basic and attractive features and the cost. features like the music player and the FM radio. The mobile supports a micro SD card of 16 GB. mAh for the global market. It delivers a talktime of 8. 5 hours for 1020 mAh and 6 hours for 850 mAh. This Nokia mobile can mange phone book, call records, SMS, notes etc. The 101 has extendable memory option and the maximum extended memory can be up to 16 GB. However, there is no camera equipped in the 101 mobile. during her multi-year investigation into the decades' old killings. Ways to get your customized blogspot to look on the search engines search?